Huacatay is native to the Southern Andes and most of the lower half of South America. It is widely cultivated and eaten as a culinary herb in Peru, Ecuador, Bolivia and Chile. Chopped Huacatay leaves can be used dried or fresh as a seasoning for soups and vegetables or as a stuffing for meat dishes. The fresh leaves can also be ground into a paste, this paste is traditionally combined with ground chilli peppers, peanuts and cottage cheese to make a sauce to pour over sliced, boiled potatoes to make a dish called ocopa. Huacatay leaves have a flavour reminiscent of mint and sweet pineapple but with an additional hint of bitterness and a strong scent of marigold flowers. The fresh leaves can be added to salads to add interest and flavour. Huacatay leaves can be steeped in boiling water to make a refreshing herbal tea. This tea has traditionally been used as a treatment for colds and stomach upsets. Similarly to other species in the Marigold genus, Huacatay makes an excellent companion plant for many vegetables including tomatoes, capsicum, chilli, cucumber, zucchini, pumpkin, onion, leek, garlic, broccoli, cauliflower, cabbage, kale, collard, brussels sprouts, kohl rabi, swede, turnip and radish. Their strong scent helps to repel and confuse insect pests and their leaves and roots release anti-nematode compounds into the soil. 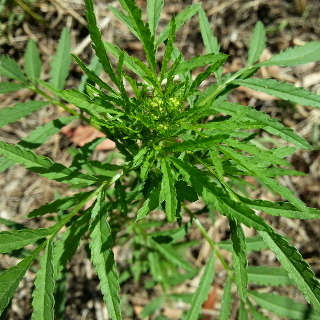 Huacatay has an added benefit as it produces compounds that are capable of inhibiting the growth of certain weed species, although it may also slow the growth of sensitive desired species, so avoid planting it around other herbs and daintier vegetables. Choose a growing site for Huacatay that receives either full sun or light partial shade throughout the day for best growth. Although Huacatay will grow in a wide range of soils and thrives on neglect, it'll still does best in a garden bed prepared in advance with the addition of lots of organic matter. Dig lots of well-rotted animal manures, worm castings or compost through your garden beds prior to sowing to improve the soil structure, encourage worms and beneficial soil micro-organisms, and provide your Huacatay seedlings with the nutrients they need to grow. Huacatay should grow fine without any additional fertiliser, but if a nutrient deficiency occurs or if grow is slow you can apply a complete organic liquid fertiliser, worm juice or compost tea every few weeks. Huacatay grows well over a wide pH range, between 5.6 and 7.6 is ideal. Huacatay is frost tender. Will self-sow if conditions are good, remove the flower heads before the seeds form if this becomes problematic. You can sow Huacatay any time of the year in subtropical and tropical regions of Australia. In temperate regions of Australia sow Huacatay seeds from September to February. Sow Huacatay seeds 4mm deep, spacing plantings about 15cm apart. Huacatay grows up to 2m tall but doesn't spread out much so can be planted close together in a clump. Most Huacatay seeds will germinate 5 to 10 days after sowing the seeds. Huacatay takes 5 to 7 weeks to start producing decent quantities of leaves. Pick the leaves before the plants start flowering otherwise they'll be more bitter in taste. Take care when harvesting Huacatay leaves as contact with the oils found in the leaves has caused photo-dermatitis in some people, resulting in painful blisters forming when the affected skin is exposed to the ultraviolet rays found in sunlight. The visible, oval-shaped oil glands on the margins of the underside of the Huacatay leaves are responsible for most of their flavour.